Story of our American National Anthem – Celebrate Our Independence on the 4th of July! Thank you Officer John Majka for posting this awesome video. May this video live on and be shared forever. Have a safe and outstanding 4th of July 2016 …and beyond! This is a repost of a video from Facebook with credit to the original post author and his comments below. Here is a video I produced several years ago that tells the true story of our National Anthem. I GUARANTEE you, if you watch this video, you will never think of our National Anthem in the same way again. May God bless America on our Independence Day! ShellGame-MERS: Contrived Confusion – A MUST READ! 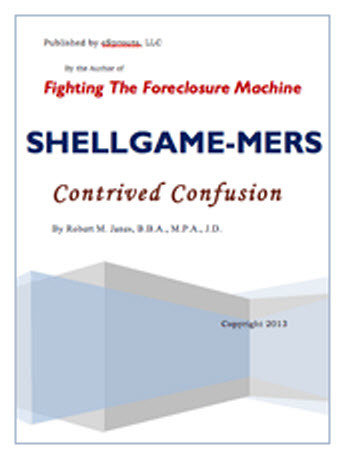 Yesterday was spent reading a brilliant new ebook ShellGame-MERS: Contrived Confusion by retired attorney/CPA Robert Janes. Not enough can be said about this powerful paper that accurately outlines the errors of the foreclosure machine. IT IS A “MUST READ”! Robert Janes has previously written a book called “Fighting The Foreclosure Machine” and has a website with the same name, with great newsletters contained therein. It is all about the UCC and the material is in regard to making the banks prove who can enforce the Note.